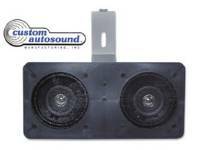 Custom Autosound Manufacturing, Inc. (CAM) was founded in 1977 by Carl Sprague in a small garage in Fullerton, California. Music and a desire to fill a need were Carl’s initial motivators. The “need” was the lack of modern car stereos that fit the original radio openings in his and other Corvette classics. From 1963 through 1967 Corvette radios were quite different. Most original radios were AM only with no cassette players or FM tuning available. During the late 1970’s cassette tapes were introduced. At that time CAM developed a technique to modify AM-FM/cassette players to fit into the original radio openings of these classic Corvettes. Carl used his own 1963 Corvette coupe to prototype his initial offerings. The initial concept of fitting modern radios into current classic vehicle was readily expanded into the car/year group applications-1955-1957 Chevy and 1964-1973 Mustangs among them. 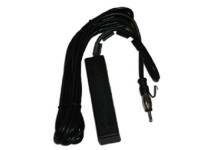 This expansion of product lines involved many hours of research and development. Part of the process involved locating the various classic vehicles, acquiring the original dashboards, and developing a minimum of two speakers required for stereo effect. 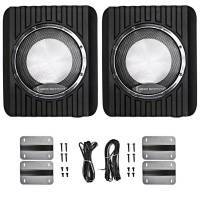 Since most vehicles from the 1940s to 1980s were originally equipped with a single front speaker, CAM developed a dual front speaker assembly that fit that area without modification to the vehicle. This was accomplished for all vehicle applications offered, providing a complete “modern” audio system for their customers. The mid 1980s brought considerable growth for CAM. They proceeded to design and manufacture their “own brand” of radios and speakers. CAM’s designs and specification from the factories allowed for more classic design (i.e. chrome radios) and better quality components than offered in current “off the shelf” units available from local wholesalers. 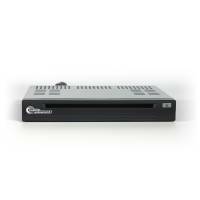 With the advent of compact disc systems during the 1990s, CAM developed several radios that actually controlled remote CD players and still fit the original radio openings. 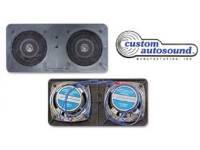 Since 1977, Custom Autosound Mfg. 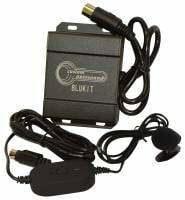 remains the originator and innovator of audio products for classic cars, trucks and streetrods. 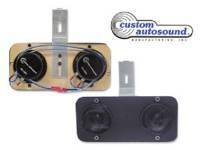 Many competitors and imitators have followed in our footsteps with similar products, but only Custom Autosound offers over 400 different radio applications for the year, make and model of your vintage vehicle, ready to install. Everything you need in one box and nothing to assemble. 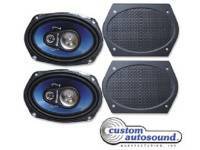 In addition to the custom radios, we offer a multitude of upgrade/custom fit speakers and kick panel speakers. 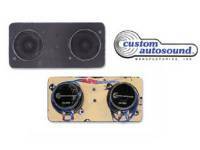 Custom Autosound Mfg. is a regular exhibitor at SEMA and is licensed by Ford and GM to use their trademarks and logos.